DRAGONS BLAM! 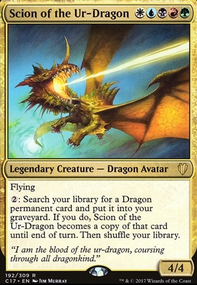 People had been trying to get me into EDH for a while, and I had a shiny Scion of the Ur-Dragon in my binder. I could have gone combo or control, but I decided to go for the crazy instead. This was my first EDH deck, and it's still my favorite. I decided to try something new and switched out all the Planar Chaos dragons for the Fate Reforged dragons. The deck plays very differently now.